The Angry Birds Games are those simple little games that everyone swears they will not get addicted too. Yet most of those that download the apps find themselves sitting up in the wee hours playing away. Of course children are monkey see monkey do. So you find your child begging to use your phone or find them on their phones with bloodshot eyes and promising they are almost done with that level. 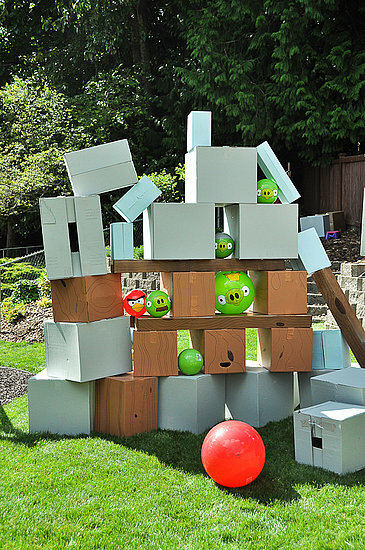 What better way to embrace the addiction than to throw an Angry Birds Party? 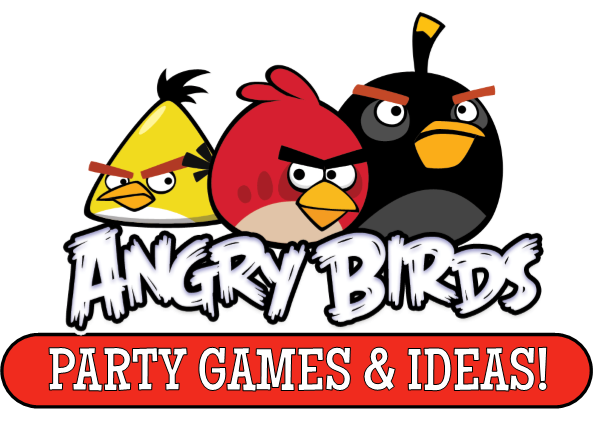 Just step into the world of Angry Birds Party Games below and have a blast stomping those little green pigs while you are at it. What better way to celebrate your Angry Birds Party than to kill some green pigs. For this game you will need lime green latex balloons, 4 darts, a marker, tape and a cardboard box. Inflate the balloons with air and tie them off. Draw a pig nose and two eyes that face different directions, to make it look like a green pig. Tape the piece that you tied off to an empty cardboard box. Have the children take turns throwing their darts at the pigs to see how many they can kill. Whoever has the most kills by the end of the game wins a prize. Those little pigs hid the golden eggs and they hid them well. Now the children must separate into teams and find as many eggs as they can. To do the eggs you can either order some plastic golden eggs online, or you can boil eggs and spray them gold. To make the game a little more interesting you can write point amounts on the eggs, the harder the spot, the higher the points. The team to gather the most eggs or points wins. This is a good game to play outside in warm weather. Fill up water balloons and place them into a bucket. Separate the children into two teams. One team is the pigs and the other team is the Angry Birds. Have the pigs stand at guard around their bucket of “eggs”. Now the birds have to try and get past the pigs to rescue the eggs before they are eaten. This is very similar to freeze tag. The pigs are “It” and the birds have to avoid being frozen by them. If they are touched they stay still until a teammate can touch them to unfreeze them. The whole time they are trying to capture the balloons. When a bird gets a balloon they can get a pig with it. Once the pig is hit they are out. When the eggs are all captured the teams can switch sides and start again so everyone has a turn to get wet. Save 10 of your cans from canned goods and paint them green. You can draw on pig faces or print the face out and glue it to the can to make them look more like pigs. To make the game interesting try to get three bean bags, one red, one black and one yellow to act as the birds. Each kid will take turns trying to knock down the pig’s fort with their bean bags. The child that knocks down the most cans takes home a special prize. This is more of a creative activity for the kids to do. Purchase some clay, try to get red, black, blue, yellow, green and brown, as these are the basic birds, pigs and wood. 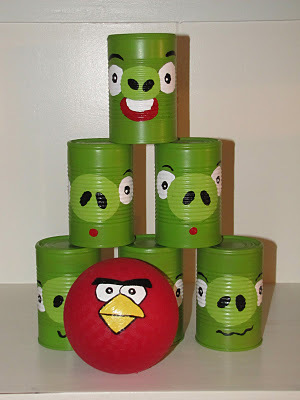 Have the children gather around and try to create their very own angry bird set up. Once they are complete leave them to dry during the party. Once the party is over you can place their pieces in zip lock bags and they can take them home with them. If you recall playing red rover when you were a child you will get this game quickly. Have the children separate into two teams and stand across from one another about twenty feet apart. The teams will lock hands and on start one team will yell “Red bird Red bird send (child’s name) right over!” The child who has been called then has to run and try to break through the hands of the other team. If they break through they get to go back to their team, if they fail they have to sit out. The last team standing wins. Visit a local store that has just received a shipment and has extra boxes out back. Get boxes of all different shapes and sizes and take them home. Have the kids separate into two teams and give them boxes and a green ball. With five minutes on the clock, they are to build their own fort to protect their green ball (piggy). Once time is up have the teams line up in front of the other teams fort. Give each player a bean bag or water balloon and have do as much damage as they can to the other teams fort. If anyone exposes the green piggy at any time, they can run over and grab it. The team to get the green piggy first wins. The whole purpose of the Angry Birds game is to slingshot the birds into the pig’s forts in order to rescue their eggs before they are eaten. If you purchase some simple slingshots, check out oriental trading, and some small rubber balls, you can have the kids do their very own version of the game. Have them set up little forts of their own using popsicle sticks and ring boxes, or whatever you what to use for the fort building. You can even draw bird faces on the rubber balls to make it more like the game. Once they are set up they can take turns building and destroying the forts with their birds. This is a little like doing a piñata but several little ones instead and all at once. You will need jelly beans, M&M’s and other little candies, clear mini cello bags, 5” green latex balloons and string. Fill each little cello bag with a bit of candy and stuff inside the balloon, inflate with air and tie off. You will then tie a string to them, all different lengths and hang them from the ceiling or a tree if you would like to do it outside. It’s best if you lie down a garbage bag on the ground so the kids can gather up the candy at the end. Draw pig noses on the balloons and tell the children that the pigs have stolen all the candy. The only way to get the candy back is to pop the pigs. The only rule is that they cannot use their mouths or feet. They will have a blast pulling down the pigs and popping them. For this activity the children will get to make their very own nests to keep their eggs safe in. Let the children gather supplies from outside like sticks, leaves and flowers or get some simple items from the craft store like pipe cleaners, fake flowers, and cotton balls. Tell the children that the green pigs are after their eggs and they need to build the best nest they can to protect them. This will allow the children to be creative and get to take their craft home.